Click the image for a free pdf of this simple shelf design. My simple shelf design is expandable to meet the needs of whatever will be stored. In this case, I have a tight space in my basement. The ceiling height is just over six feet, so I have built a storage shelf that is four feet tall. This allows storage space on top of the shelving unit. My first suggestion to build simple shelves in tight spaces is to leave room. Secondly, figure out what is primarily being stored… In my case I’m doing mostly tote storage because my basement here in Indiana is wet during parts of the year. I have a four foot height set for my shelves, and will have two shelves underneath. The basement is wet, so the entire thing will be on blocks to protect the shelves from moisture, as well as the bottom shelf is at ground level. The second shelf is equal distance from the bottom of the top shelf and top of the bottom shelf. Each space in this case is 18″ tall; plenty of height for a Rubbermaid tote. I went with 2×4’s and 1/2″ OSB for this shelf design. Like always, if I can come across some wood that is good and reusable, the design is molded by what I have. In this case, I have a few sheets of scrap OSB wood that are 3’x6′, so I’m using that wood to meet my need. Normally for a basement shelf I use plywood, but I find it more appealing to use wood made available free of charge. Like this article is so aptly named, the design to build simple shelves is VERY simple. The shelf platforms are rectangles of 2×4’s screwed together with 2 1/2″ exterior building screws. Plywood or OSB shelf-top material is cut to the size of the rectangles. Since I’m using recycled OSB, I used four of my 2 1/2″ screws near the corners of the platform and then several 1 1/4″ screws around the rest of the top. The shelf height determines the next step. What I like to do is attach the shelf uprights to the bottom shelf platform with four screws at each corner. I usually put them on the short end of the shelf, but the uprights can go on either the sides or front and back. Once the uprights are attached to the bottom, turn the shelf on its side and attach the middle and top shelves. Any shelving unit with more than 2 shelves will be plenty sturdy without any further supports. This simple shelf design can easily be expanded to be eight feet wide or even more by adding secondary supporting uprights to the middle of the shelf. If the shelves are going to be deeper than the 18″ I made mine, consider using thicker plywood or OSB or adding supporting crossbeams similar to floor joists. For heavy-weight applications, lag bolts are stronger than standard construction screws. I hope this article on how to build simple shelves makes for an easier time building shelves to meet your needs. 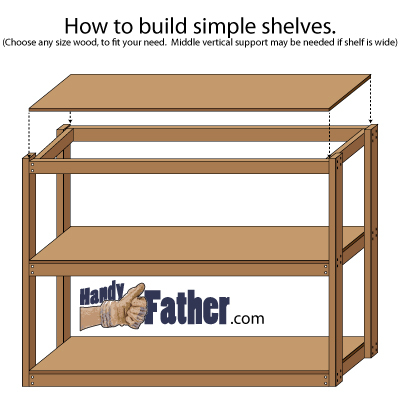 Not everyone is up to building, so you can click here for simple shelves . If you’ve used this simple plan to build your shelves, drop Handy Father a line and let us know in the comments below, tweet @HandyFather, or post on facebook at Handy Father’s facebook page.